I would like to thank you again for the priceless knowledge and skills you have passed on to us at the UK Summer Camp 2006. I have been practising diligently twice daily. My skills seem to be increasing gradually, my stances are more solid although my legs are frequently very sore. I feel healthier and happier and I have more energy throughout the whole day. I also feel that my Shaolin practice is supporting me in achieving my goals and dreams. I am glad of your progress. Diligent practice is essential. If one practices diligently what he has learnt from me, he will certainly derive many benefits. What I am happier is that your practice is helping you to achieve your goals and dreams. We emphasize this aspect of our teaching, which makes us quite different from many other schools and which many other students may not realize. In most other schools, students merely learn chi kung or kungfu. There is not much relationship between what they learn in their chi kung or kungfu and in their daily life. But in Shaolin Wahnam we do not merely learn chi kung or kungfu. We relate what we have learnt in our chi kung and kungfu to our daily life, making it more rewarding for ourselves and for other people. I have some queries with regards to my practice. I would be very grateful if you could shed some light on these questions. I have noticed that whilst doing chi kung and Shaolin stretching if my breathing is gentle and natural, my energy flow seems to automatically move me through the different patterns with minimal physical effort. Is this a normal progression in the Shaolin arts? Congratulations. You have done well. Yes, this is a normal progression in the Shaolin arts provided these arts are taught and practiced at a high level. High level Shaolin arts involve energy and mind training. Yours in an example of mind directing energy, and energy moving your physical body. You accomplish this in a chi kung state of mind, when your breathing is gentle and natural, and when your physical body is relaxed. In this way you can accomplish more work with less effort and you are not tired. If your breathing is forced or rough, or if you tense your muscles, you would be unable to accomplish this; you would have to resort to laborious effort, and become tired easily. Today as well as in the past, high level Shaolin arts are rare. Much of Shaolin arts practiced today use muscular effort instead of energy and mind. This year I have spent a lot of money on my education to become a professional stock trader. Thus, I will not be able to come to the UK Summer Camp 2007 or to Malaysia this year. Will my progress in Kung Fu and Chi Kung stagnate if I have to wait till next year to come for another course? No, not only you will not stagnate, you will continue to progress if you continue to practice on your own. The courses you took at the UK Summer Camp last year as well as all my other courses are self-contained. You need not attend another UK Summer Camp or any other courses. You just need to practice and enjoy what you have learnt. If you have any questions or problems, please don't hesitate to contact me or any of our certified Shaolin Wahnam instructors; or you can post your questions in our Shaolin Wahnam Discussion Forum, and our instructors will answer them. Nevertheless, many repeat their courses or take other courses with me or other certified Shaolin Wahnam instructors. Taking other courses is understandable, but why do they repeat courses they have taken before? The main reason is to deepen their skills. It may be surprising to other people, but students who repeat a course generally derive more benefits than new students. They also enjoy meeting old and new Shaolin Wahnam members. Our courses are excellent places for our international family members to meet again and build warm family ties. I was worried when I read in the Irish Shaolin Wahnam Website that your retirement might be imminent. I have a deep desire to be a skilful disciple of the Shaolin arts. Will I still be able to come to Malaysia to learn from you in the future? I have thought about retirement for some time. I have fulfilled my obligation to the 10th Shaolin Law, i.e. passing on the Shaolin arts to deserving disciples irrespective of race, culture and religion. Our certified Shaolin Wahnam instructors worldwide are doing well, and if I retire now I know that they will successfully continue to spread the Shaolin arts. However, I have to postpone my retirement because some instructors have committed themselves to new areas, and it is only proper that I have to support them. Sifu Markus, for example, has derived a lot of benefits from our Shaolin arts and is dedicated to spread the arts to the Scandinavian countries to help people overcome problems that he previously had. Sifu Emiko has just spread the arts to Japan where many people have benefited. Yes, you can come to Malaysia to learn from me. After my retirement from public teaching and travelling, I shall conduct occasional courses for Shaolin Wahnam members only. Nevertheless, even if you don't learn from me, you can learn from many of our certified Shaolin Wahnam instructors who are very competent, and they can help you to be very skilful in the Shaolin arts. Last month my mum was diagnosed with high blood pressure. She is quite overweight and the doctor immediately put her on medication. I felt that I had to teach her "Lifting The Sky" and she was interested to learn. I showed her how to do it and now she has a small chi flow in every session and feels quite refreshed and relaxed afterwards. Did I do the right thing in teaching her since I am still a beginner? Yes, you did the right thing, and you did it well. Congratulations. If your mother continues to practice daily and enjoy her practice without worrying about whether she practices correctly or not, she will overcome her high blood pressure in a few months. While I warn people not to teach unless they are qualified, I also encourage our students to teach their parents, children or close friends – not at the level they have learnt from me, but at a much lower level. “Lifting the Sky” is an excellent exercise for this purpose. Chi kung may operate at three levels – the form level, the energy level and the mind level in this order of progression. If you teach chi kung at the form level, your students are quite safe even if they make mistakes in their practice or you made mistakes in your teaching. Mistakes here refer to those made due to carelessness or forgetfulness. For example, one needs to be relaxed while practicing. If he forgets or is careless and tenses his muscles once a while, that is alright. When he realizes his mistake, he relaxes as best as he can. This is different from a person who purposely goes against the instructions. He knows from the instructions that he has to be relaxed, but he tenses his muscles thinking (erroneously) that this would give him more power. In other words, he tries to be smarter than all chi kung masters throughout centuries who have emphasized relaxation. This person is obviously heading for trouble. The benefit from form-level chi kung is naturally not as much as that from energy-level chi kung or mind-level chi kung. The difference in levels lies not in the form of the exercise but in how the exercise is practiced. In other words, one may practice “Lifting the Sky” at the form level, at the energy level or at the mind level. When you learned from me, you operated at the mind-level. Hence, you were able to generate an energy flow on the very first day. If those practicing at the form-level can generate some energy flow after a few months, they would have done well. More than 80% of chi kung practitioners today, including some “masters”, are unable to generate an energy flow even though they may have practiced for years. A main reason for this pathetic situation where a great majority of chi kung practitioners worldwide cannot generate an energy flow, and therefore do not derive much benefit from their practice, is due to many people teaching others before they themselves are qualified. 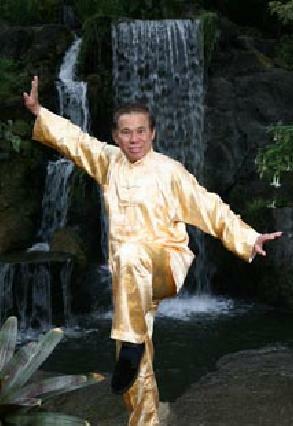 They confuse chi kung with gentle physical exercise. 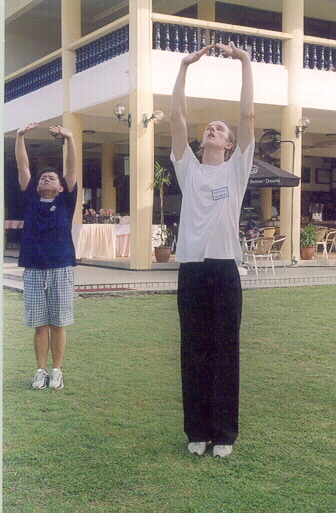 If they teach “Lifting the Sky”, for instance, they teach only its external form; they are unable to use the form to generate an energy flow, which is actually what chi kung exercises are meant for. As an analogy, when unqualified teachers teach Taijiquan, they merely teach its external forms; they are unable to use Taijiquan form to develop internal force and for combat, which is what Taijiquan forms are meant for. For the past one and a half years I have been attending a weekly class at the School of Economic Science and Practical Philosophy. The school is inspired by the Indian concept of Advaita, but also embraces a wide range of philosophers, thinkers and writers. In a couple of months we will be taught a meditation practice where we are to focus on a sound that we repeat in our mind. Can this meditation or the teachings in this school cause a conflict or hinder any future practice of Shaolin Wahnam Kung Fu, Chi Kung or Zen? No, our Shaolin Wahnam arts will enhance whatever you do, including the meditation practice you will learn in that school. You will be pleasantly surprised that you can achieve better results and in shorter time than your classmates. It is worthwhile to repeat that whatever you have been doing or will do, you can do better as a result of practicing our Shaolin Wahnam arts. This is a main reason why we are dedicated in our practice. If a person works as an executive, raises a family and plays football as a hobby, he can now do all these things more efficiently and enjoyably due to his daily practice of our Shaolin Wahnam arts. Why is this so? It is because all our Shaolin Wahnam arts – Shaolin Cosmos Chi Kung, Shaolin Kungfu and Wahnam Taijiquan – train energy and mind, and equip us with a sound philosophy of life. The arts promote harmonious energy flow, resulting in good health and vitality. Whenever we train we clear our mind of all thoughts and gently focus on our exercise, resulting in mental clarity and one-pointedness. We relate our training principles to our daily life, resulting in our living our lives the Shaolin Wahnam way, enabling us, amongst other benefits, to be kind, open-hearted and happy. I believe that you are one of the few masters who recognize the negative development in Chinese martial arts with its degeneration to a pretty dance. So I decided to do the traditional Shaolin style like you teach it in your books. I'm doing my training nearly every day but because of my small flat I have to do it in the forest. For hardening my arms I'm hitting trees. Today I can do around 1000 hits with my fist against a tree without having pain. Some friends of mine said that it is dangerous to do this. Do you think that it is bad for my bones to do this exercise? Hitting trees with your arms or fists until you feel no pain is not what I teach in my books or classes. Yours is what we in Shaolin Wahnam call “water-buffalo method”. Although I myself used water-buffalo methods in my young days, now I prefer and teach internal methods using chi kung and meditation. Not only they are more pleasant in their training, they produce more powerful results as well as good health and spiritual development. Water-buffalo methods, on the other hand, may be detrimental to health and does not contribute to spiritual cultivation. Yes, what you do is bad for your bones. Your fists may be deformed. Hence, before you can use your fist for self defence, you already have hurt yourself. This is not a wise thing to do. Nevertheless, intenal methods need to be learnt personally from a competent teacher. If you need to use water-buffalo methods because you have no access to internal methods, you should use medicinal wine in conjunction with your hard conditioning to prevent harming your arms or fists. I'm doing my Single Leg stand in a river on wet stones. Do you think I will have a better balance in a shorter time or is it the same as if I do it on the normal ground? If all other things were equal, you would have better results training in a river on wet stones than on normal ground. Your better result is due to your demanding conditions. In other words, because you cannot afford to make mistakes, your progress is faster. Nevertheless, the difference in results is not big, and it is not worth to risk injury training in such conditions when you can train on safer grounds. Good Shaolin training not only enables us to be combat efficient, but also make us wise. Risking yourself unnecessarily is unwise. Moreover, other things are not equal. When standing in a river on wet stones you will probably be more concerned in preventing yourself from falling than on relaxing totally. In other words, you are more likely to be both mentally and physically stressed, whereas on safer grounds you will be more relaxed. As relaxation is a key factor in stance training, your progress is likely to be slower standing on risky stones than on safer grounds.